1. In a small frying pan, slowly toast the sesame seeds over a low heat until golden, about 4-5 minutes. Reserve a large pinch of the seeds to decorate, and grind the remainder in a pestle and mortar (or in the small bowl of a food processor) until fine. Mix in the soy, sugar, vinegar, mirin and miso; set aside. 2. Bring a pan of slightly salted water to the boil. Blanch the broccoli for 2-3 minutes, or until just tender. Drain, rinse in cold water, then pat dry on kitchen paper. 3. Transfer to a serving platter, sprinkle over the reserved sesame seeds and serve alongside the dipping sauce. 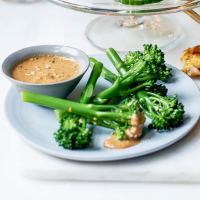 The sauce can be made up to a day ahead, and the broccoli cooked and cooled up to 6 hours in advance.